Europe's new foreign policy chief, Italy's Federica Mogherini, will visit Israel, and the PA, just a few days into her five-year term. Europe's new foreign policy chief, Italy's Federica Mogherini, will visit Israel, and the Palestinian Authority (PA), just a few days into her five-year term. Mogherini officially assumed her post as High Representative of the European Union for Foreign Affairs and Security Policy on Saturday, Nov. 1. The European Jewish Press reports that she will arrive in Israel on Friday, November 7, for a two-day visit during which she will also travel to Ramallah, seat of the PA government. Mogherini was Italy's foreign minister, representing a government that is considered generally pro-Israel – as opposed to her predecessor in the EU, Catherine Ashton of Britain, not counted among Israel's closest friends. Italy is also said to be tough on Iran’s nuclear program. Just this past July, then-Foreign Minister Mogherini visited Israel during Operation Protective Edge against Hamas. She visited, with Israeli Foreign Minister Avigdor Lieberman, an Israeli house hit by a Hamas rocket in Ashdod. Mogherini said, during her confirmation hearings, that her term in office would be characterized by a more prominent EU role in Middle East affairs. “In the Middle East in particular," she explained, " the EU has been an effective payer; it needs to become an effective player.” The EU recently pledged 450 million euros (over $560 million) for the reconstruction of Gaza– its share of absolving Hamas from responsibility for the catastrophe it brought upon Gaza this past summer. 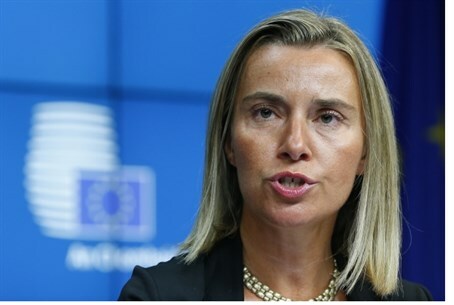 Mogherini, for her part, said at her confirmation hearing that the EU "might" use financial "incentives and disincentives" to get the peace talks between Israel and the PA re-started.